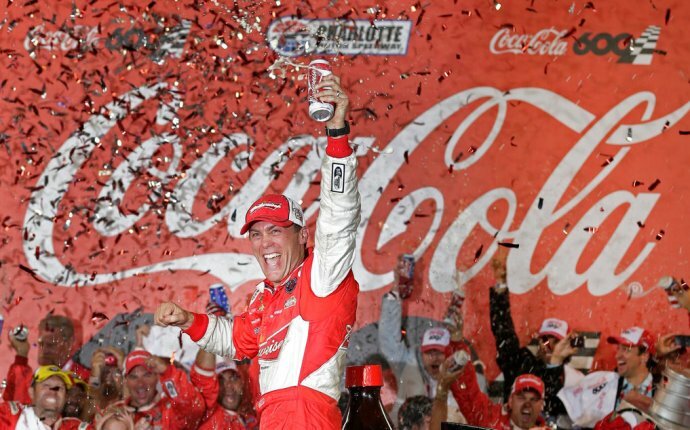 Who Won the Coca Cola 600? CONCORD, N.C. - Hall of Fame car owner Richard Childress finally let the emotions flow when he looked up at the Charlotte Motor Speedway scoring board after the Coca-Cola 600 and saw the iconic No. 3 - driven by his grandson Austin Dillon - on top. "Can you believe it?" Childress asked. "The Coke 600, Austin Dillon and the [No.] 3." It had been a long time coming for the number made famous by the late Dale Earnhardt, who drove for Childress during six of his seven championships. The last time the two celebrated was when Earnhardt won at Talladega on Oct. 15, 2000, four months before The Intimidator's death in a horrific crash at Daytona. "Today is special, " Childress said. Especially with how Dillon accomplished it. Crew chief Justin Alexander decided that while much of the field would pit with about 35 to go, Dillon would stay out and gamble he'd have enough fuel to make it. "It didn't make much sense to do anything else but that, really, " said Alexander, who replaced Slugger Labbe as Dillon's crew chief last Monday. When Dillon saw Johnson run dry right ahead, he felt relieved and excited all at once. The No. 3, Dillon said, "was the best of all time. I'm just glad to add to the legacy of it." Dillon held off Kyle Busch and Martin Truex Jr., who led the most laps in the Coca-Cola 600 for a third straight year. Austin Dillon's first Cup series win is more than just about it being No. 1. It's about grandfather and car owner Richard Childress, the legacy of Dale Earnhardt and one big sigh of relief. "It hasn't sunk in. I can't believe it, " Dillon said. "We're in the Chase, baby. It's awesome." Dillon did his signature belly slide celebration in the damp grass at Charlotte, outlasting a rain delay of nearly 1 hour, 40 minutes - and several established drivers - to take his first checkered flag. He closed racing's biggest day with the surprise victory, following Sebastian Vettel's win in Formula One's Monaco Grand Prix and Takuma Sato's victory in the Indianapolis 500. Truex took the lead for the final time with 67 laps left, sweeping past Busch to move out front. Truex pitted a final time with 33 laps left, confident he'd be able to hold on after everyone cycled through a last stop. Truex has led 756 of the past 1, 200 laps in the 600 yet finished shy of the checkered flag two of three times. "So that's a little tough to swallow, " he said. Matt Kenseth was fourth and Denny Hamlin fifth. Kurt Busch finished sixth, followed by rookie Erik Jones, Kevin Harvick, Ryan Newman and Dale Earnhardt Jr., who finished 10th in his final Coca-Cola 600 as a full-time driver. "I did all that I could from that point and just came up a little bit short, " he said. Harvick, who started on the pole, may have had to work harder than the rest of the field for his seventh straight top 10 here. He dealt with a loose-fitting wheel much of the first 200 laps to fall a lap down then slipped on some slick fluid laid down by Ty Dillon to fall back further. But Harvick, who won here in 2011 and 2013, held strong to end in eighth. Kyle Larson, the series points leader coming in, was expected to vie for his first Coca-Cola 600. Instead, he started 39th when he couldn't take a qualifying lap Thursday because of trouble clearing inspection. Larson got as high as third during the race before scraping the wall with 153 laps left and needing three trips to the pits to correct the problems, falling to 23rd. His chances ended for good when he tagged the wall again 45 laps later, went to the garage and did not return. He was 33rd, his worst finish of the season. He said he got loose in Turn 3 to end his race. "I made a mistake, " Larson said. WHO'S HOT: Kyle Busch sure does love Charlotte Motor Speedway. He won the trucks race and the All-Star race here last week then qualified second for the Cup race Sunday night. He nearly walked away with the Coca-Cola 600 when he moved past teammate Hamlin at the start of the fourth and final stage to take the lead over Truex. Busch held strong until the restart with 67 laps left following a caution brought out by Danica Patrick's brush with the wall as Truex moved back. Busch got back to second on the last lap but ran out of raceway to chase down Dillon. WHO'S NOT: Chase Elliott was hoping to finally land his first victory on the season at Charlotte Motor Speedway. Instead, his chances ended less than 25 laps into the race when he ran over pieces of Jeffrey Earnhardt's crumbling car and could not gain traction as Brad Keselowski slammed into the rear of the No. 24 Chevrolet. Elliott started third and looked like a strong contender for NASCAR's longest race. Instead, it continues an alarming downward trend for one of the sport's youngest guns with his fourth consecutive finish of 24th or worse. "It's just disappointing, " Elliott said.